The process of shipping a vehicle from North America to Europe is not nearly as difficult or expensive as people assume. There are two options to ship, Roll-On, Roll-Off (RoRo) and inside a container. RoRo is usually cheaper, but it means you must give the vehicle keys to the port workers who will drive it on and off the vehicle “ferry”. Some people have no problems, others report horror stories of almost everything not bolted down being stolen. 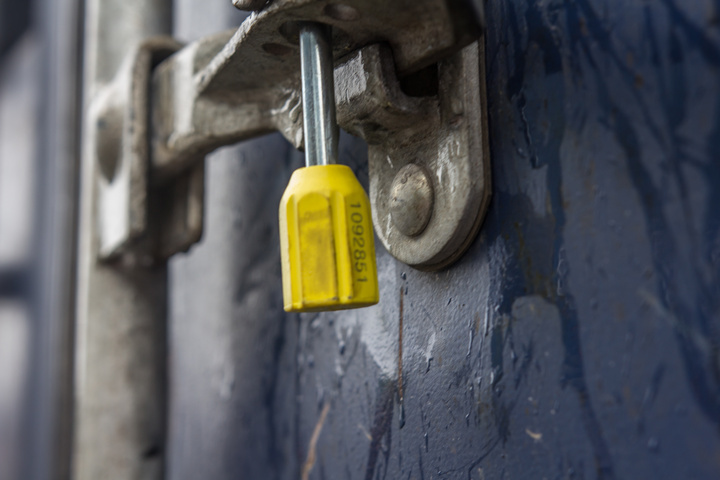 It’s common advice to separate the rear cargo section with a steel cage and padlocks, and make sure the keys you provide can not open that section. Lots of people wind up using chains and padlocks to protect their stuff, and even then there are reports of stolen or damaged items. I personally was not willing to take that chance, so I was happy to pay a little extra and ship the Jeep inside a shipping container. 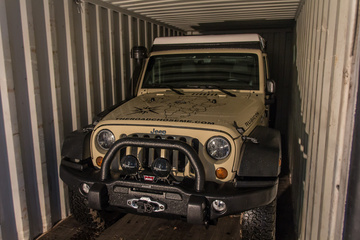 Most 4x4s fit inside a regular 20 foot container, though be sure you check the size of the door, it’s a bit smaller than the container itself. Remember you can always lower your tire pressure to gain another inch if needed. If you can find someone to share with, it’s much cheaper to put two vehicles in a 40 foot container and split the costs. If your vehicle is taller than the door on a 20 footer, going with a 40 foot “high cube” container is an option – the whole container and door is quite a bit taller. Choose a shipping port somewhere on the East Coast of North America, as it will be cheaper and faster than shipping around from the West Coast. Common choices are Halifax, Nova Scotia, Boston, New York, and various ports in Florida. It’s basically the same price to ship into any port in Western Europe or the UK, pick one that suits you best. Usual candidates are Antwerp in Belgium, Bremerhaven in Germany or various options in the UK. I chose Antwerp because it’s further South so I will spend less in gas driving to Southern Spain, and I don’t have to pay to get it across from the UK on the train. Usual suspects for quotes are Seabridge, Affordable Freight and weshipcars.co.uk among many others. It helps to be a little flexible in your destination port if you want the best price, and ships usually sail every week or two. Lock in your best option, and give yourself plenty of time to arrive at the departure port with days to spare. Rushing adds lots of unnecessary stress to the whole thing. Clean the vehicle until it’s perfectly spotless inside and out, especially underneath on the frame and anywhere else mud might be caked on. Then clean it again until it shines like new. There will be a customs inspection at the destination port, and you really want to avoid paying extra because it needs to be cleaned for agricultural reasons. Empty the vehicle of all food. 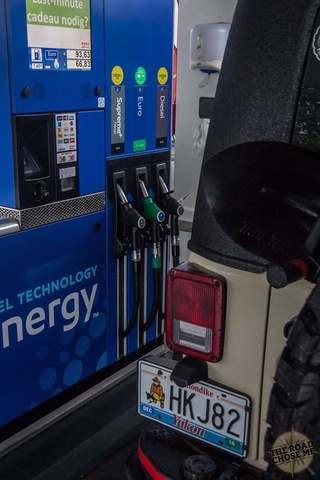 Make sure it’s almost out of gas/diesel – shipping agents want less than 1/8 of a tank at most. You will have to load the vehicle at least a few days before the ship sails. It’s easy enough to drive into the container and climb out either the drivers window or out the back. 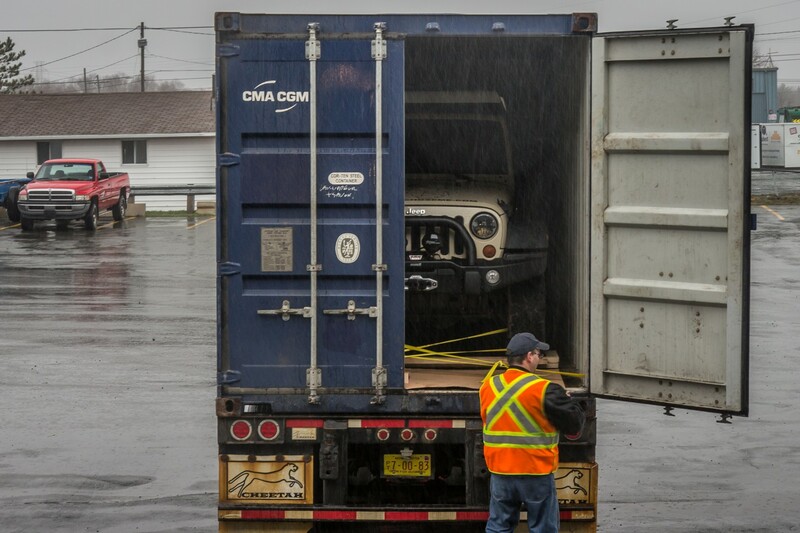 The loading company will secure the vehicle to the floor of the container, and likely disconnect the battery. Watch them seal the container so you know it’s safe, and take a photo or write down the numbers on the customs seal, and the numbers on the container. Wave goodbye to your friend as it is taken away. 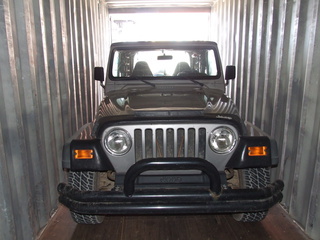 Now the vehicle is loaded and on the way, you can pay for the shipping, and receive a receipt for that. You may or may not get your Bill of Lading now, which is the official document showing what’s in the container, and who owns it. You can get it later too, no worries. Now it’s loaded, you can book your own plane flights. Doing so beforehand is risky incase there is an issue, and again will add to the stress of the whole thing. WestJet now fly direct from Halifax, NS to cities in Europe and the UK, it’s an extremely easy ~5 hour flight. 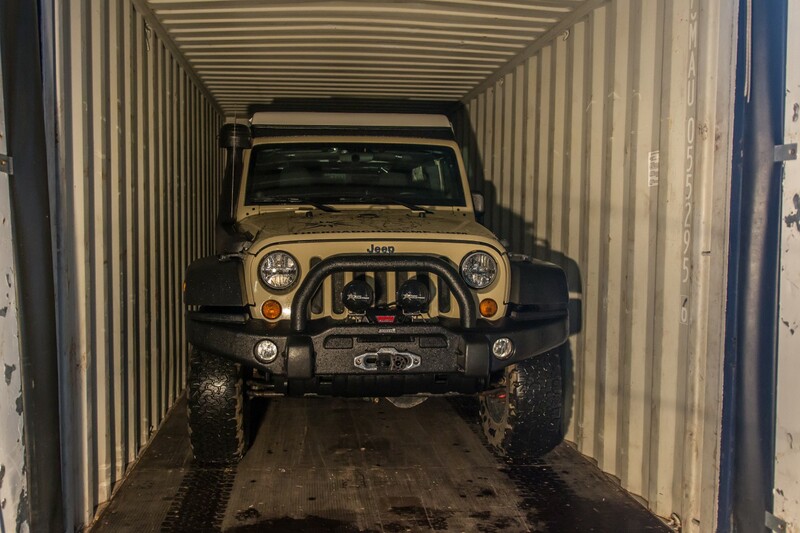 When shipping inside a container you can’t walk into the port to get the vehicle yourself, you must pay a freight forwarder to do this for you. Ask your shipping line for recommendations, there are always tons to choose from. Get as many quotes as you can, prices vary a lot. 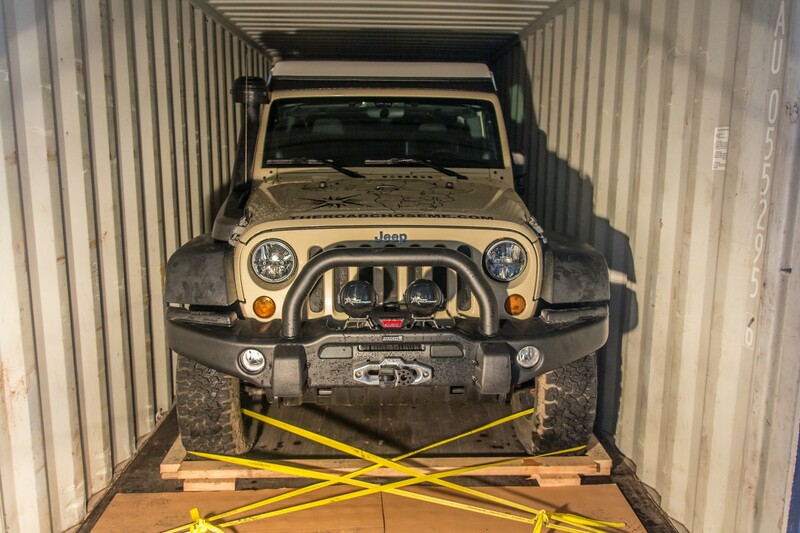 I wound up paying €1449 Euro to have my Jeep taken out of the container and to clear customs, which is extremely expensive and I was not happy out how much the price kept going up for seemingly no reason. That being said, everything was done perfectly the first time with absolutely no problems. Drive out of the port with a huge grin on your face, and enjoy your European adventure. Just watch out for the extremely expensive gas! Following your adventure and feeling a bit envious. I’m happy and relieved your noble steed made the trip ok.
Best of luck to you. Have fun and be safe. Oh, and have you given your steed a name? I had a Subaru that was a workhorse affectionately called “Rusty” who I miss every day. Do you need any kind of European license plates? I don’t think the Spanish police have to many Yukon cars! Nope, I can drive with my Yukon plates into virtually every country in the world. It usually just takes some paperwork at the border, maybe buying some insurance, and I’m good to go. I came across your site on Reddit. I currently live and work in Morocco and was reviewing your plan of travel. I would love to connect and help you think through some serious challeng you are going to encounter. That’s awesome, thanks very much. I’ll shoot you an email now. Haha, not quite my friend. Dan, this is a great resource. My wife and I are kicking around the idea of this and it truly helps to understand the costs. Thanks for taking the time to make the website and update it so often! Thanks for the feedback, I’m happy to hear you find it useful!! Where are you guys thinking about going? Hi Dan, thanks for sharing the experience. I am currently trying to ship a car from Europe to Canada, but I struggle to find an affordable shipping quote. Would you be able to share other shipping agents than the ones listed in your post? Those are the ones I called. I got such a good quote from Sandy I didn’t need to call any others! Good luck, watch out for fees on the receiving end, that’s where they made a killing from me! Thinking of shipping my car from Halifax to Europe and then driving it around Europe for 2 weeks. After that I want to storage the vehicle somewhere for 5-6 months until I fly back to it and continue my adventure. What are the rules with customs for doing something like this? I guess what im asking is, are there countries in Europe where i am allowed to leave my vehicle for an extended period of time and leave the country myself by air. I am no expert, though I think that without a carnet de Passage The Jeep was permitted in Europe for 3 months, no longer. Also note some people have had to pay a huge bond to get a vehicle into Europe without a Carnet, which you get back when you leave. I was lucky and did not have to pay. I think if you wanted to do what you are proposing, you should get a Carnet de Passage. Google Boomerang Carnets. We are heading the same way as you next month! 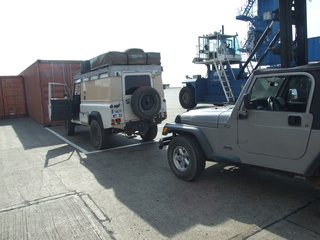 shipping our Land rover Defender to the UK next week, ywe will be touring Europe for 3-4 mounths then head down to South Africa from the west coast. We are a family from Montréal (Québec) and we only have the rear license plate on the truck. I see it is the same for the Yukon plates… did you have any trouble crossing borders in West Africa with only a rear License plate? Thanks for the info and hope you are enjoying your trip!!! Awesome, you will have a great trip! I drove with only one plate (Alberta) from Alaska to Argentina and it was OK, but it did mean more bribery attempts. To avoid that in Africa I had a plate made up at a sign writer and put it on the front, and I recommend you do that same. You will deal with enough bribery attempts as it is, you don’t need to give them another reason! All the best, I think you will find http://wikioverland.org extremely helpful – check each country! Let me know if I can help at all, I will do what I can! What do you mean by ‘bribery attempts’? Did you mean robbery? I mean Police and military checkpoints where they look for any excuse to say you must pay them money. i.e. it’s illegal to only have one plate in this country, therefore you must pay a $20 fine. Thanks for your response Dan! All the best for the rest of the trip..who knows we might come across each other in the comming year somewhere in Africa!!! Great post and thank you for it. We are looking to ship our SUV to Europe from NY – do you know what are the costs to ship your car back to the states? Is it included in that original quote you paid of more or less 3k? It is most definitely NOT included – that is a one-way shipping price. I did not get any quotes to go in the opposite direction, but I assume it would be similar. Great post. I am looking to ship my car to Germany then drive it to another country where I will register it. Can you tell me more on how to insure it and clear customs, and how long it takes to get your car back? Thanks so much and have a great day. Sorry, I don’t know anything about registering a car elesewhere and all of that. I just pass through each country, so I don’t have to do that complicated paperwork or get inspections or anything like that. My husband and I will do a very similar trip like your first one, the pan-american highway from Alaska all the way to Argentina. We live in Belgium and we’re trying to decide whether to buy a van (probably a Volkswagen LT or a Mercedes Sprinter) and build the interior in Belgium, ship it to the east coast of North-America and drive it all the way to Anchorage to be able to start our trip or to fly to Alaska and buy and build our van over there in Anchorage. We have been saving for this project (with some struggle along the way) for three years now and your website was the first information I saw from somebody else doing the same. Your website helped me a lot to make it from dream to a realistic project. Also for knowing how much we needed to save up. So a very big thanks for that, really!!! We will be leaving in May of 2019. Wow, this turned out to be a long comment, but I hope you are willing to tell us your ideas. The decision to bring your own vehicle or to fly in and buy one is a very personal decision and one that can go either way. You are right, it’s extremely unlikely you will find a Sprinter or any VW van in Alaska. 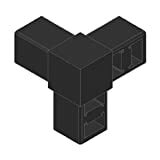 Even if you find something suitable, you will have to fit it out – for that you need a shop and tools and things to buy. Also think about if you can register a car in a country you don’t live in, and how you will renew it once on the road. All of those things often make it more complicated that having one from home, and that’s why I have always taken a car from home. I wish you all the best, let me know if there is any help I can provide! Try asking in the Facebook Group “Overland Sphere” plenty of people have done it, so you should find an answer. Thank you for your post! My girlfriend has always wanted to do an expedition in Spain and bring a car, this at least gives me an idea of the possible cost and expenses for the trip. Thanks for the feedback, I’m happy to hear it was useful! For a single country for not a long time, I really think renting makes more sense! I wonder if I can take my car from Ontario, that still is under finance, to drive it for a month in Germany? I’m not sure if you need to get permission to leave the country with a car under finance… I have no experience with that, sorry. I am working on my Sprinter Van conversion. My plan is to travel around Europe and Especially Africa. I want to do Kenya, Tanzania, Zimbabwe, and South Africa for sure. I am debating on my route. Leaving Ontario, do I got to the East coast, ship to Europe, or, Drive South to Uruguay? Then Ship to South Africa? Either way it will be an adventure, just not sure which way to start. I do know that Europe and Africa are a must. South America, is growing on me but still not a passion. Do you have any advice? It’s really up to you! It depends what you want to see and experience, what the weather will be like in various parts of the world at whatever time of year and things like that. Personally, I would not miss South America! What company do you use to ship your car to Europe? I’m currently looking to ship my car to the UK, but could ship to Mainland Europe and drive to the UK and I’m trying to find a good shipping company. I got quotes from all the companies I listed and just went with the cheapest at the time. I think it changes month to month who is the cheapest. Hello, I need some help please. I want to ship my car overseas and transit Europe but the shipping company is asking that I need prove of residence from the country destination. Otherwise I cannot do the the custom clearance. Any thoughts? Hi Gabriela, Hmmm… make it clear you are just transiting that country – the vehicle will NOT stay there and will NOT be imported there.. it’s just passing through. What country are you shipping into? Some EU countries want a deposit to ensure you will transit and not stay.. and certainly a carnet would handle this for you. Good luck ! Let me know how you make out! Thinking of shipping my car from Halifax to Europe and then driving it around Europe for 2 weeks. After that I want to storage the vehicle somewhere for 5-6 months until I fly back to it and continue my adventure. What are the rules with customs for doing something like this? It will depend on which country you ship into, and what the customs officer on the day feels like. Option 1 is to get a Carnet De Passage, then it’s easy and you pay nothing more (than the cost of the Carnet). Without one, the customs officer might just let you in free, or they might ask for a sizeable deposit that you will get back when the vehicle leaves the EU. The official EU rules say “it’s at the discretion of the officer” if you pay a deposit or not. I was lucky, didn’t have to pay one, but I know others that shipped in around the same time as me that did have to. If you really not going to be there all that long, just get a rental is my advice. Hi Dan thanks for your post and let me tell you that it so helpful, could you tell what freight company did you used to ship your vehicle to Belgium please i am planning to ship one too. I got quotes from the ones I mentioned then just went with the cheapest. The prices change all the time, so it’s probably best to get your own quotes! $3000.00 USD isn’t bad. You couldn’t rent a Jeep Rubicon for this amount in Europe. This seems like a viable option if you plan to have an extended stay. I’d love to ship my car from Halifax, NS to Reykyavik, IS and make my way to mainland Europe from there. A jeep like yours would be north of $250.00 USD per day in Iceland. The shipping agent I used in Halifax said she once organized shipping vehicles to Iceland, and it was EXPENSIVE! Thanks. Your article explains the process very neatly. Thanks for sharing these useful steps with us, these really help a lot when shipping a car. Keep up the good work and share more useful information. Good Luck. I also have a Jeep Wrangler and I have fitted it out to travel here in Australia. 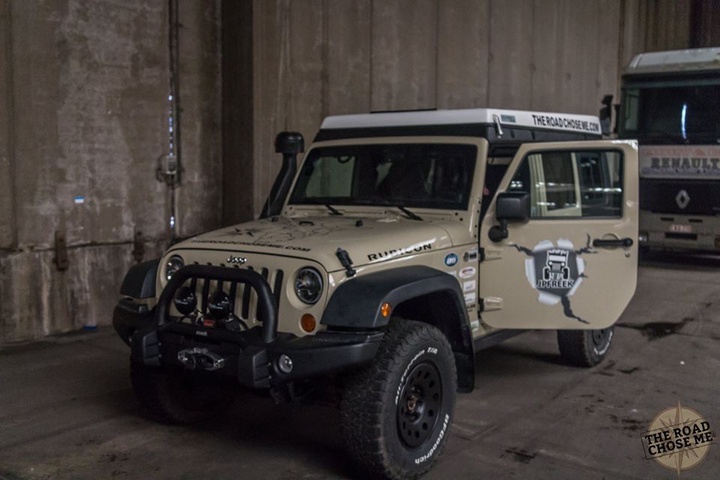 I will be in Spain January 2020- may 2020 and want to bring the Jeep bc I don’t know what else to do with it and don’t have the heart to sell it, and traveling Europe in it would be pretty awesome. That’s great to hear you’re looking to explore Europe! Mine was not searched at all when it entered Europe – but I did have to get European Green Card Insurance, and if you don’t have a Carnet De Passage (International Customs Document), you might be required to pay a large deposit when the vehicle enters Europe, which you get back when it leaves. This is at the discretion of the Customs officer when you enter, and there isn’t anything you can do about it. I was lucky and didn’t have to pay, but some people do.